The Heart Transplant Ambassador Program is based on the concept of looking to one’s peers to learn from their experiences. Knowing that others have survived the experience, and are available to discuss it, can be both helpful and reassuring. In this setting, the word Ambassador refers to one who is a guide or teacher. Ambassadors are individuals to be there is instill the confidence and encouragement to move forward. The program is designed to provide information, guidance, and emotional support to those involved in the transplant process and to offer a network that a) helps those experiencing the process in overcoming the sense of being alone and, b) encourages them to stay active before and after transplant. Providing you with peer support. Providing you with helpful transplant information. Ambassadors can offer you education from a peer perspective. This one-on-one communication with another transplant patient offers an individualized highly personal account of the transplant process. It is rooted in the mentor’s own experience. Helping you work with your transplant team. The importance of working well with your transplant team cannot be over emphasized. Ambassadors, because of their personal experience, can assist you in learning to interact in a productive way with your transplant team. Providing you support and encouragement to comply with prescribed medications and exercise. Encouraging you to stay active. You are invited to take advantage of this support system. The Ambassador Program is entirely voluntary and is offered to all transplant candidates and their families. You have a right to privacy. You have the right to expect that discussion of your illness will be conducted in a private manner. You may refuse to talk or see anyone not directly involved in your care. Your medical records are also private. Someone from the hospital will ask for your permission before anyone will visit with you. You are invited to become an Ambassador. 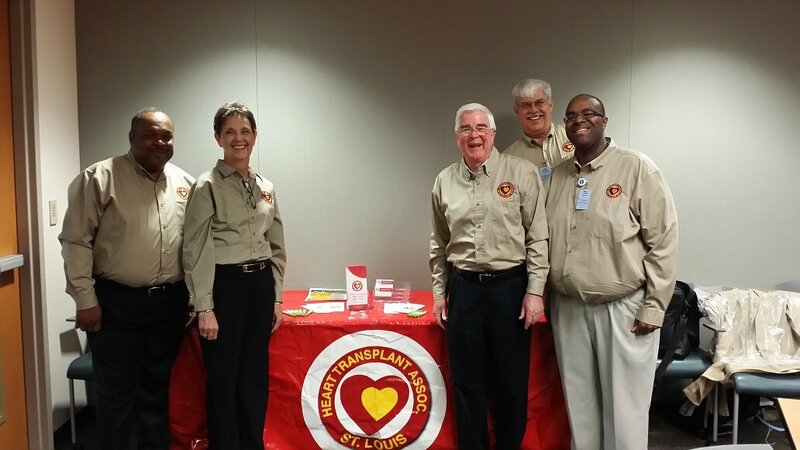 If you are interested in becoming a Heart Transplant Ambassador, contact Larry D Bonds (314-265-6475). There are Organ Transplant Ambassador Training Sessions conducted during the course of the year. The St. Louis Heart Transplant Association strongly encourages its members to visit patients that are awaiting transplantation. The Transplant Ambassador Program does not want to discourage visitations by people who have had the experience of a heart transplant. When you are in the hospital, please take the time to ask someone from the Transplant Team if anyone is waiting for a transplant and visit them to give them support and encouragement. To be in compliance with the patient’s rights someone from the Transplant Team or the floor nurse should get permission from the patient before your visitation.